It's been too long since I've given you an update. Seriously. I know I've used the same line before but there's a big payoff at the end of this journal entry. Stick with me, we're making progress. When I left you last, I had just finished the installation of my '37 Buick's fuel tank and rear leaf springs. To finish off the rear suspension I added the rear stabilizer bar and shock links. As soon as the rear suspension was complete, I installed my car's wheels and pushed it out into the direct sunshine for the first time in 4 years. I grinned, took a few photos and pushed the old girl back into the garage. At this point, trout season opened in Pennsylvania and I hit the water during all of my spare time. Since I'm trying my best to be both a good father and a good husband, I only have a limited amount of spare time for hobbies. If I'm spending time fishing, I'm not spending time on the Buick. Days turned to weeks and weeks turned into a month. Then one day, a couple of interns came to my library. The three interns that we had this year came from the automotive restoration program at the Pennsylvania College of Technology. They're young, enthusiastic and already have a large amount of mechanical ability. They were just what I needed to really get my Buick moving and I could hire them on the side when they weren't working for the library. Before too long I had an intern bending and flaring me new fuel lines. 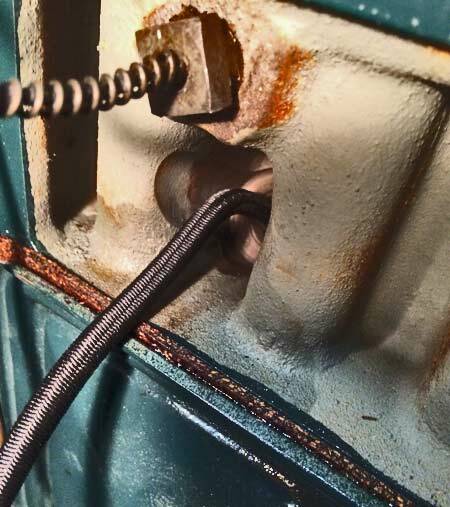 The Buick has one long line running along the passenger side frame rail and that long line connects to a small feeder line that enters the fuel pump. It's a simple run and not prone to leak. 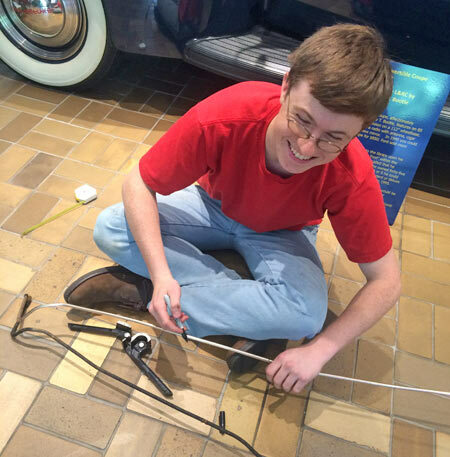 My enthusiastic intern bending my new fuel line. Fear not, I paid him for his trouble! 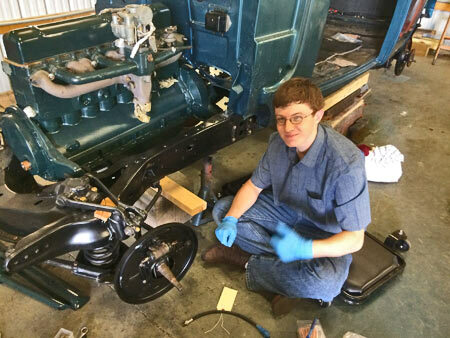 Once the fuel line was installed I had one of the interns over to my house to help install the brakes on all four wheels. While I could have easily installed the brakes myself, there's something inspiring about having an enthusiastic kid working on your car. His energy was the refreshing breeze I needed after working on this project for four years. During the brake installation I opened up my wheel cylinders to peek inside. I was disappointed to find congealed brake fluid and stuck cylinder pistons. Clearly water got to these cylinders since taking them off the car in 2013 and I decided a simple hone job wouldn't be enough. The cylinders were boxed up and ready for shipment to Apple Hydraulics for brass sleeves and a professional rebuild. Normally I like to save money and do things myself but this component is pretty critical and the extra cost over new aftermarket cylinders is worth it to me. I also had new emergency brake cables made by George Martin in Myerstown, PA. If you need new brake cables, George is the man! He is extremely old school though and doesn't have a website. If you need his contact info get in touch with me. This mess is what I found inside my wheel cylinders. A sleeve and rebuild is in order! This is the driver's side front backing plate. I used an old inner tube as my dust seal. Preston helps with the reinstallation of my brakes. 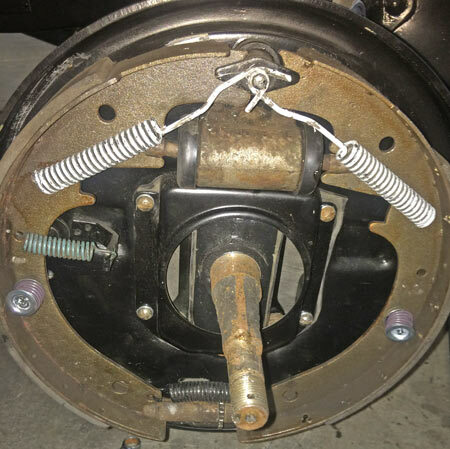 The brakes are installed. I would soon pull the wheel cylinders and send them out for a professional rebuild. The Buick rests on her tires for the first time in years! 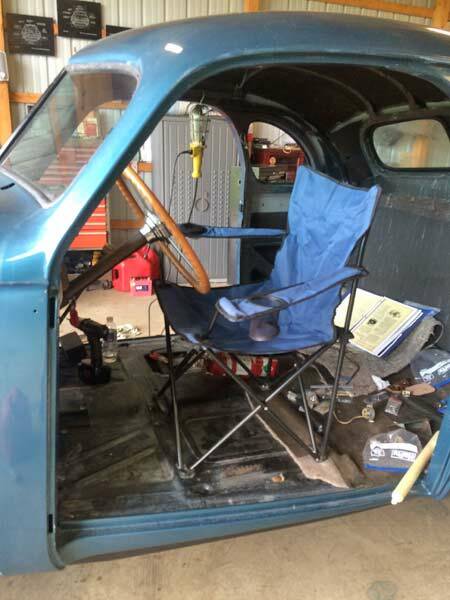 With wheels on the car, fuel line installed and most of the brake components installed, it was time to turn my attention to my car's wiring. I made my car's wiring harness by myself back in 2011, and, fortunately, used the same color wires as the original. I also did a good job labeling and photographing all of the wire connections when I disassembled the car in 2013. Notice I said "good" job and not "excellent" or "outstanding." While most of the connections were clearly marked there were a few loose ends that left me scratching my head. I eventually resolved all of the issues with a multimeter and the original wiring diagram. Since I rebuilt my engine myself, I think I had been subconsciously avoiding that first attempted startup. If I didn't do things right during the rebuild, the end result would be embarrassing, time consuming and expensive. With no other side projects lingering, I was forced to wrap up the engine. 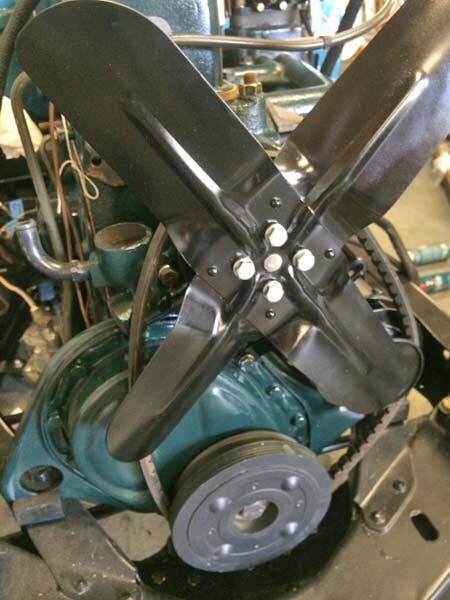 First I installed the generator and starter followed by the cooling system's bypass, hoses, fan and water pump. My original water pump was truly the original pump that came on the car. This pump featured a small oil reservoir on the top that fed a wick that was used to lubricate the pump shaft. 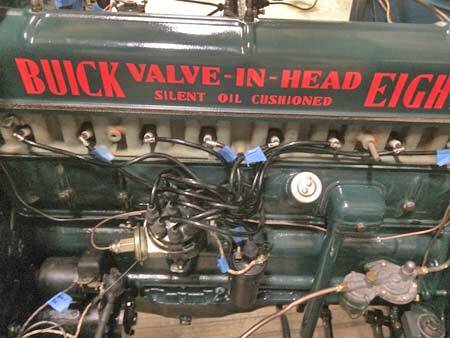 This design was only used for a short time so replacements and Buicks made after 1937 had a sealed bearing in place of the wick. 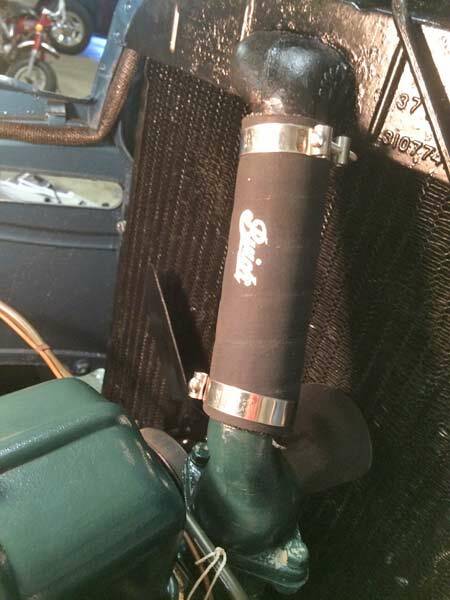 The new design was clearly superior so the pump I installed on my rebuilt engine was of the new style. 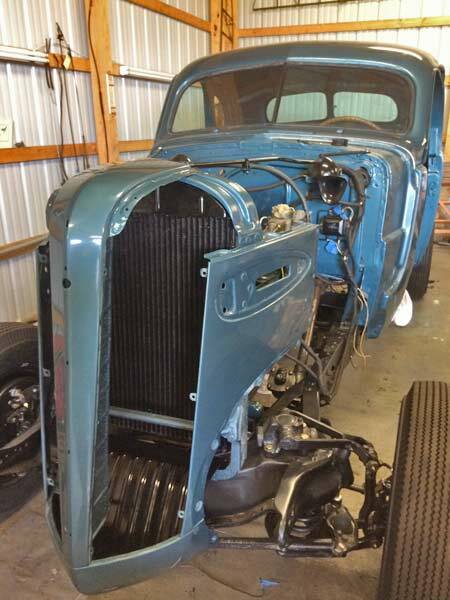 After the cooling components were installed the radiator and front end nose was set in place. With the nose on the car my heart really started to race — my car was looking more and more like a car. The starter slides into position, the solenoid would go in on top soon. The cooling fan is set in place. The radiator mounts into the nose. Extra sheet metal sure looks great! Taking a peek at the top hose. Before I attempted to turn the engine over I knew I'd need to oil prime the engine. During normal operation the distributer turns the oil pump. A long, slotted shaft connects to the underside of the distributor which is turned by gears that mesh with the camshaft. Before installing the distributor I had good access to the oil pump shaft. 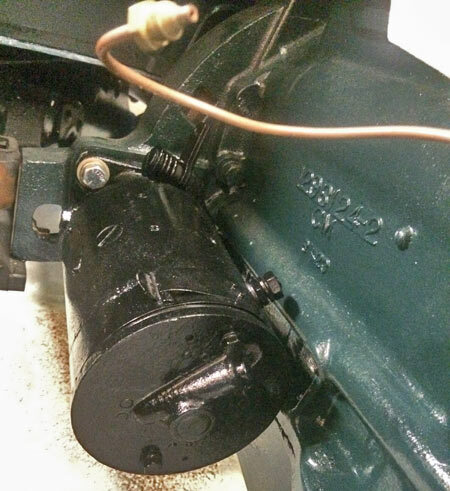 I installed a cold chisel into a cordless drill, placed the spade of the chisel into the pump shaft and started spinning the oil pump shaft counterclockwise. 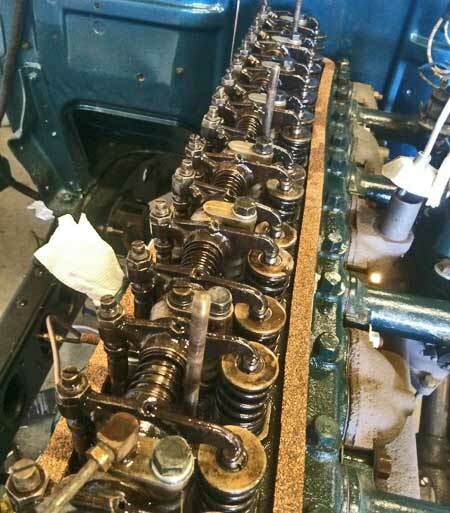 In just a few seconds oil was flowing throughout the engine and pressure measured on the oil pressure gauge and visually verified by looking at the rocker arm shaft. In case you're wondering why I used a cold chisel, it is because I didn't want to cut a large screwdriver and the chisel's wide tip fit nicely in the pump shaft. Rocker arm shaft is set in place. Rocker arm shaft is torqued down and engine is oil primed. I had planned on an attempted engine start the weekend after I oil primed the engine, however, a serendipitous email would delay that attempt. 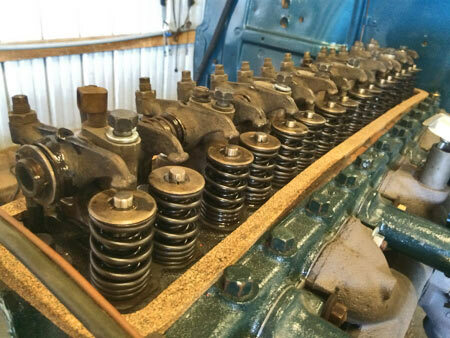 A reader of this website contacted me out of the blue because his cylinder head was at an engine rebuilder. 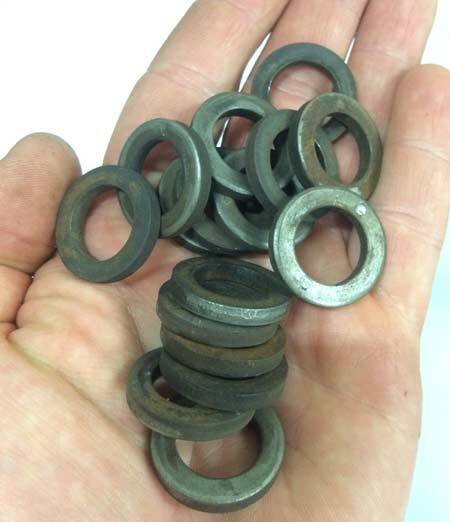 The rebuilder had a question about some washers in the head that should either go under the inner valve spring, on top or the inner valve spring or not used at all — the reader had instances where all three scenarios were used. Upon reading this email I instantly knew the answer as I had 16 extra washers set aside and, until that moment, didn't know where they belonged! A well-timed random email solved the mystery as to where these washers belonged! The washers need to go UNDER the inner valve springs. When I sent my head off to the machine shop for cleaning and new valve stems it came back with the washers. Sludge must have held them in place when I disassembled the engine and I visually verified this with old pictures. I quickly weighed my options and realized that while this wasn't a devastating mistake on my part, it would be time consuming to fix. To fix this I used the "rope trick". This simply involves filling a cylinder with rope (or exercise band or bungee cord) and turning the flywheel by hand until the rope compresses and provides resistance. 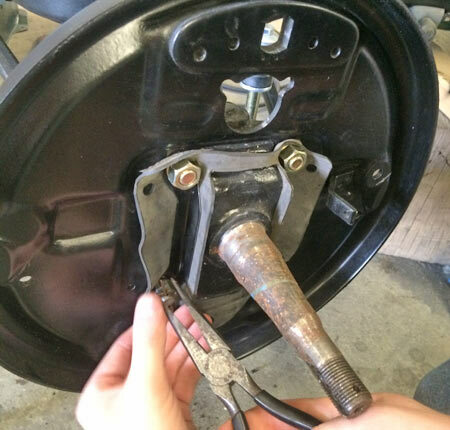 From here you can use an overhead valve spring compressor to compress the springs and remove the keepers, slide the springs off and install the washer and reinstall everything. The compressed rope prevents the valves from falling into the cylinder when the keepers are removed. This little project took 2 Â½ hours and my fingertips were very sore afterward! As a side bonus I installed the vinyl lettering on my valve cover while it was off of the engine. A length of rope protrudes from cylinder #8. This was used when installing the valve spring washers. Buttoned up and ready to go, don't those letters look great?! The modest captain's chair during the test run. I then oil primed my engine again and installed the distributor. It was almost show time. I found my battery and connected the terminals. No smoke, no fire. I decided to "flash the field" on my generator and then I turned the key and flipped the ignition switch to on. Still no smoke and no fire, I must have gotten all of my electrical connections right. Here was the moment of truth, would the starter turn the engine over. I hit the starter andâ€¦YES, it turned right over. I left the starter turn for a few seconds and then stopped, walked to the front of the engine to look at the fuel pump's sediment bowl to make sure the pump was priming the line. To my dismay, there was no fuel in the bowl. I tried the starter again, still no fuel in the bowl. 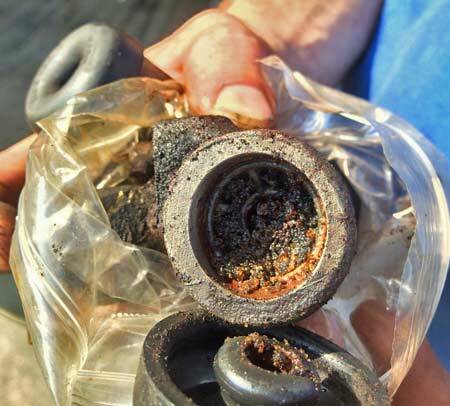 I then disconnected the fuel line at the carburetor and sucked until the sediment bowl was filled, confirming there were no blockages. I trickled some fuel directly into the carburetor throat, hit the starter and the car started instantly. Two seconds later it died and I knew I had a fuel flow issue but I was absolutely thrilled that the engine ran after all those years and all of that hard work and frustration! Assuming the fuel flow issue was a pump issue, I removed the fuel pump from the engine and realized that when I installed the pump I place the actuating foot behind the cam shaft and not directly on it. It was a simple, honest mistake and one that was quickly and easily fixed. 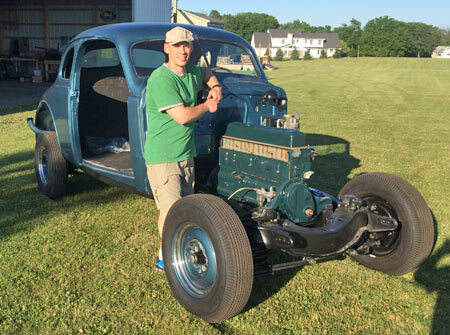 With the pump installed correctly, I hit the starter and the car started and ran beautifully. To me it sounded better than any V-16 Cadillac or modern engine I'd ever heard. This was MY engine and my car. I'm surprised I didn't start crying tears of joy right there but, I didn't. After a couple of minutes I jumped out of the driver's seat to do a walk around of the engine and I discovered my fuel pump was leaking gas out of a little hole under the diaphragm. I shut the car down and realized the diaphragm must have a hole in it, likely around the screw holes and likely caused by sitting in the same position for the 3 years it took me to rebuild. 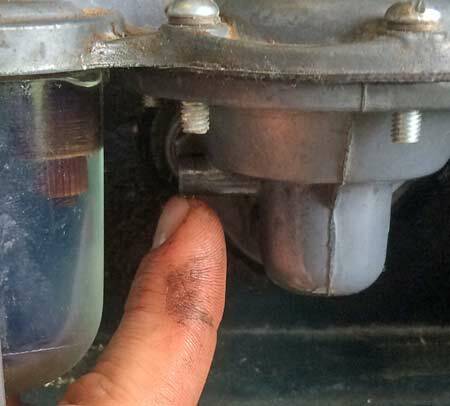 Pointing to the port where fuel was leaking out of my fuel pump. 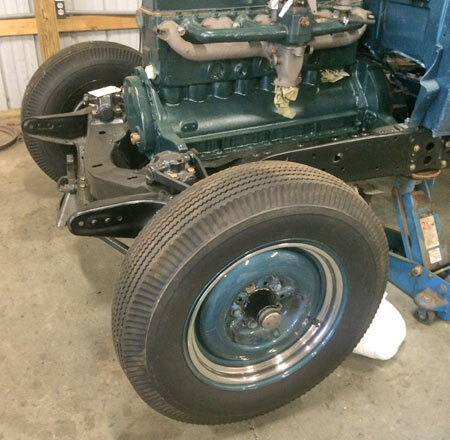 The fuel pump is now off of the engine and in transit to Arthur Gould Rebuilders in New York. They will professionally clean, rebuild and inspect the pump for only $90. They even throw in a 1-year warranty and their turnaround time is something like 5 days. I should have the rebuilt pump back next week and engine testing will resume. Once I can confirm there are no more fuel leaks I'll be driving around my property and the adjoining grass airfield. I can't wait.